If you’re planning on selling your home anytime soon--or in the next couple of decades, for that matter--pay attention! The largest generation of prospective homebuyers are finally entering the real estate market en masse, according to the National Association of Realtors and the Pew Research Foundation. That means that you are now marketing to the Silent Generation, the Baby Boomers, and the Millennials. With three distinct generations who each have their own online search preferences, your internet marketing tactics are even more critical now than ever before. 94% of millennials used online research in their search to buy a new home this year. 84% of their older parents or grandparents--the Baby Boomers--used online research in the quest for a home to purchase this year. 45% of Baby Boomers and the Silent Generation rated virtual tours as highly valuable in narrowing down the homes they chose to tour. 36% of Millennials rated virtual tours as highly valuable in selecting their touring short list. The average buyer toured only 10 homes before selecting one to purchase. What do these home buying statistics mean for your home sale? If you're marketing a home, then taking advantage of as many opportunities to engage your potential buyers as possible is imperative. If between one-third and one-half of the potential market for your home highly values a virtual home tour, then making sure that your home listing includes one will definitely help get your property on that increasingly short list of homes for your prospects. If you’re marketing to military families, then you’re marketing to a segment of the market that has an even shorter house hunting time than the majority of the population, making any element of online marketing just that much more important. If military is your market, then one of the increasingly critical tools to include in your online marketing strategy is a virtual tour. What does a virtual tour entail? A virtual tour can be as simple as digitally stitching together the photographs of the home to create a sense of a wider scale view or walk-through for potential buyers. Given that military families often house shop from their current duty station before they even begin their PCS, providing a sense of being in the home is truly added value. If you want to splurge on making sure that your home can really make potential buyers feel at home in your home regardless of where they are in the world, then consider adding a 3-D video tour to your marketing plan. In larger markets with high price points, such as New York City, 3-D tours are an increasingly popular element in the marketing repertoire of real estate professionals. These updated tours offer buyers an opportunity to interact with a potential property in a manner akin to walking through a miniaturized doll house. Think of the 3-D virtual tour as Google Earth for your house! If you plan to add a virtual tour to your online house listing, then many of the same best practices apply from staging for your real estate photography shoot. Include a tour of the bathroom, especially the master, but remove the toilet paper and leave the toilet lid down. Better yet, try to minimize any visual of the commode in your tour, though that’s a little harder said than done in a tour versus a photograph! Include a tour of the kitchen. The kitchen and the bathroom are the two key areas where buyers look to see just how “updated” a home is. If buyers aren’t looking for a project, and let’s face it, not too many military families have either the time or liquid cash for one of those, then they’ll want to make sure that your bathroom and kitchen are good to go. Include a tour of the backyard or any outdoor living space. Outdoor living space has been creeping up on the list of must-haves for military families, and if you’re listing your home in spring or summer, then the demand for outdoor living space soars. As a buyer, it’s much easier to imagine yourself spending time grilling or with the dogs out back in the warmer months than in the winter. Include a tour of the master suite. A large master suite is high on the list of must-haves for most families, and one that can accommodate a king bed easily is a bonus. Include a tour of the office or extra living space. While a living room, dining room, kitchen, bedrooms, and bathrooms may have worked just fine in the past, today, those primary living rooms just don’t cut it. Prospective buyers want to see flex space in the form of an office, den, pocket office, or loft for either working from home, which many military spouses do, or for their media entertainment space. Include a tour of your front door and entryway. 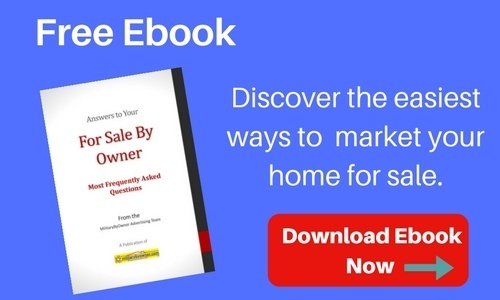 Literally walk your prospective buyer into your home, and have them feel welcome. In a busy marketplace, a nicely decorated, inviting entry may just be enough to allow you to welcome an offer on your home sooner! Include a tour of your neighborhood amenities. Far too many online listings fail to take advantage of marketing the many community amenities that attracted the current homeowner's purchase of the home in the first place. If you have a pool, play area, or great running trail, then by all means, include those in your tour. If your best amenity is the quiet country road that leads to your neighborhood, then sell that. Someone out there wants quiet country roads, so help them find you! Need more tips in marketing your home? Click below to download MilitaryByOwner's FREE e-book.